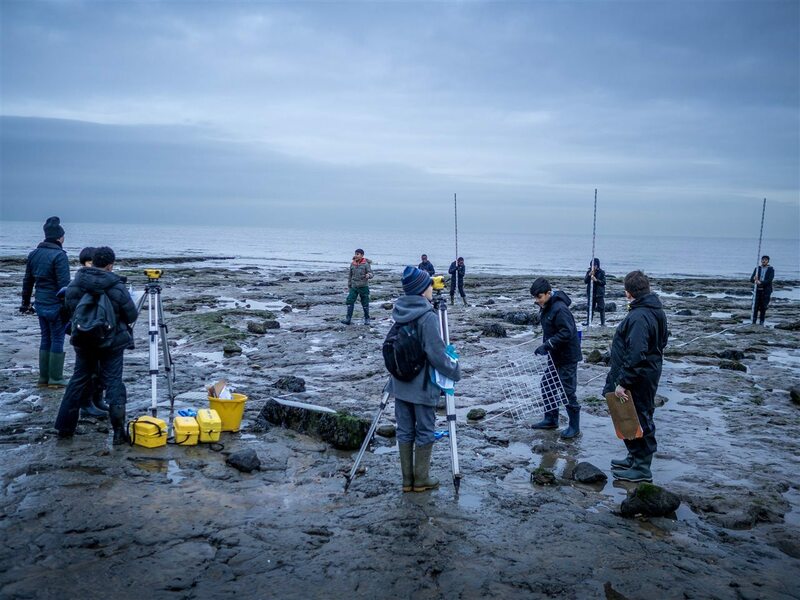 To complete their field study based on Coastal Erosion, which forms 20% of the Geography Common Entrance grade, Year 7 & 8 visited Walton on the Naze in Essex. Naze is the old Saxon word for nose as, before the rapid erosion of the last 700 years, this area resembled the slope of a nose. The group arrived at Flatford Mill, Suffolk on Monday 13th November after visiting Colchester Castle. Flatford Mill is the location of John Constable’s famous portrait ‘The Hay Wain’, completed in 1821. You can see the original painting at the National Gallery in Trafalgar Square, London. The boys stayed at Valley Farm, where part of the building dates back to the early 14th Century. Fortunately for the pupils (and teachers!) the building has been updated for the 21st Century with the addition of heating and plumbing. On Tuesday the group departed for Walton to complete a field study. The boys used theodolites, ‘dumpy’s’, to measure the gradient of the beach and quadrants to conduct sediment analysis. Results were recorded on both the managed and unmanaged beaches, the former consisting mainly of sand, the latter London clay. It was a wonderful opportunity for our pupils to use sophisticated equipment to learn about physical geography in a practical way. Back at Flatford Mill, everyone embarked on a night walk through the surrounding forest. They did not use torches, but were guided by linking arms to shoulders and relying on sight and hearing. The boys loved this experience and it really opened up everyone’s eyes to the beauty of the countryside in darkness and the capabilities of natural night vision. The boys spent the last day writing up their methodologies and then with a visit Willy Lotts house, the house featured in the famous ‘Hay Wain’ picture. The boys, Mr. Ortiz and Mr May all had a wonderful time and look forward to sharing their observations of coastal erosion at Walton.